Saturday April 29th turned out to be a great day weather wise, just a little drizzle in Am then a beautiful day. 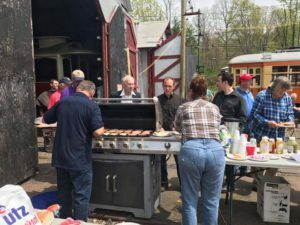 With over 110 members in attendance, each had a chance to operate or ride on a number of cars (316, 1504, 302, 1602, 850, 6688, R-9, 865, 1792 and 5466). In addition a number of recently repaired cars where on display: 500, 2898, 220, 4573, 503 and 2001. There was an added feature this year in that with the lead to building 9 complete, the Atlas offered trips all day into 9 and car 25 NJT PCC offered rides on the lower run-around track. There where cars running every which way all day. Breakfast was served at 0900 and then off to the trolleys, at 11 AM was the dedication of the “G” scale set in memory of past board member Lee Lagerstrom. Lunch was served from 12 to 1 PM and back to the trolleys. At 3 Pm we cut the cake a long honored tradition at BERA, there might have been a few fingers of frosting left on the sheet, but our Assistant treasurer made short work of the frosting. At 5 PM a dinner was served with: Rolls, baked Ziti, Chicken Marcella, Eggplant Rollotini, Roast Beef and Pan fried potatoes. No one left hungry after that dinner! In all there where many happy faces after operating their favorite car down the line. With the Talley not in we estimate over 45 trips where made down the line. By 9 PM the last of the trips was made and cars put away for the night. Great start to the 2017 season! !